The pump station is an Italian designed and built one piece unit made by Novaspher. It has a 3 speed Wilo Pump and pressure gauge, temperature gauge, pressure relief, one way valve and adjustable flow rate with sight glass. It also has the 3/4""bsp fitting for the expansion vessel. The unit comes in an injection moulded foam case that both insulates and cuts out noise. 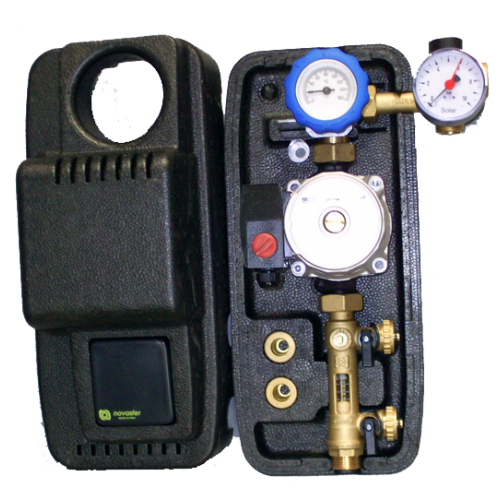 The pump is complete with filling ports and has a fitting kit in the front box. We have been using these pumps for about 5 years now and have only had good reports. They are an efficient, silent running and long lasting pump!